A lot of people still like the Dead Fifty years after the Dead played their first note, the fan base keeps growing. 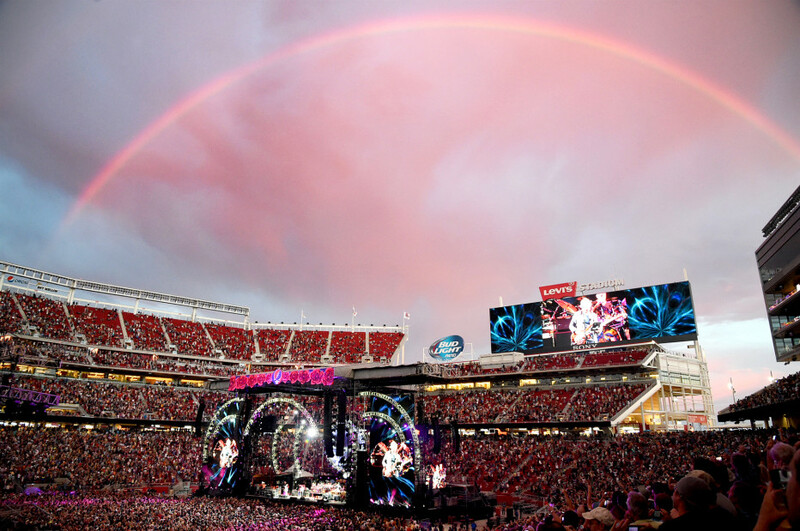 About 350,000 tickets to the five Fare Thee Well shows were sold, but that was only one part of the omnichannel distribution strategy for the event, which also included pay-per-view (the largest PPV music event in history), a Sirius radio stream, satellite broadcasts into theaters nationwide, social media and full shows from tapers in the audience that are already up on archive.org. Attendance at the Sunday show at Soldier Field (71,000) broke all records for the venue. Combined gross for the five-show tour will probably exceed $55 million. The numbers, however, are only a reflection of the passion of the fans. It was a breathtaking moment to look over the stadium at the closing show and see every single person standing, arms up, shouting out the chorus to “Samson & Delilah.” It was a self-contained universe, united by joy, passion, and the “mystic chords of memory,” to borrow a phrase from another American who was good at getting people together. “Be Kind” is more than a slogan “Are you kind?” the Dead asked in 1970 in “Uncle John’s Band.” And, indeed, kindness became a fundamental ethic of the Dead community. Forty-five years later, Mickey had the last word at the closing show when he ended the evening with the reminder to “be kind.” For me, the words from “Scarlet Begonias” (“Strangers stopping strangers/Just to shake their hand”) came alive Sunday night at Solider Field. I was sitting at the end of an aisle and it seemed like every 5th person who walked up the aisle put a hand on my shoulder or just stopped to shake hands (one guy stopped to share the meaning of the universe, or at least his particular universe, but he was an exception). The whole evening was kindness incarnate. 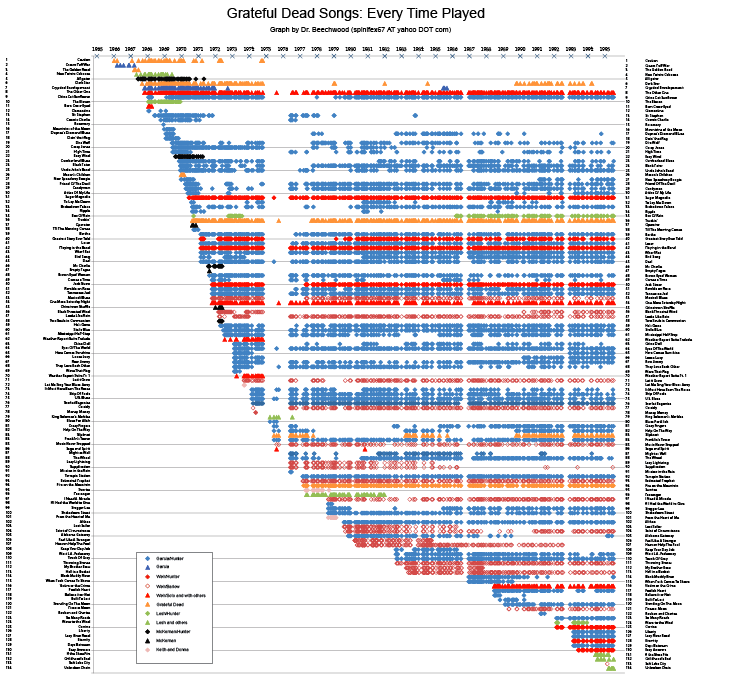 The Dead have a very deep songbook The chart above isn’t very legible, but it tracks how many times many of the songs in the Dead’s oeuvre have been played. I don’t know the exact count, but there must be close to 500 songs in their repertoire (original and covers). Half the fun of the Fare Thee Well shows was guessing which songs they would pull out that night. There were themes (psychedelia at Levi’s on Saturday, Americana at Soldier Field on the 4th), but otherwise it was just a stroll through the canon. They’re not all great songs, but even the weaker ones were redeemed by the outstanding executions. 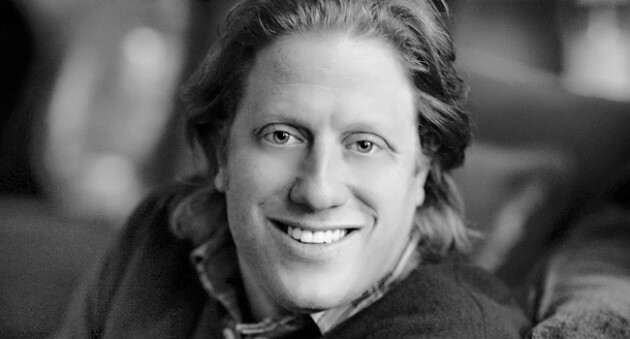 Peter Shapiro is a genius These shows probably wouldn’t have happened – at least on this scale – without the vision and tenacity of promoter Pete Shapiro. Naturally, there was a lot of grumbling along the way (not really the Grateful Dead without Jerry, a money-grab, rigged tickets sales, etc.). But in the end, it all worked, magnificently. He’s this generation’s Bill Graham. The Dead still haven’t stopped growing The Dead have reinvented themselves more times than Tiger’s swing – from the Warlocks to the GD in 65; the psychedelic bloom of 67-69; the turn toward Americana in 70-72; the electric Dixieland of 73-74; the muscular elegance of 77-80; the surprising revival of the late 80s and spring of 90. 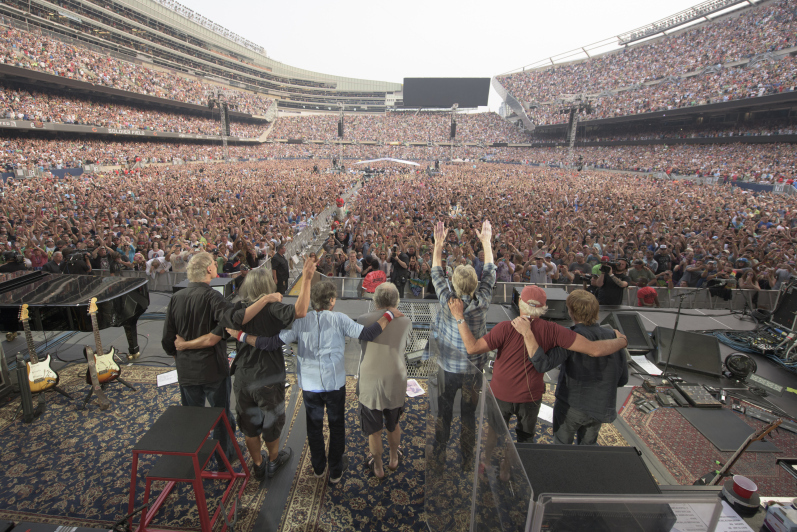 On stage Sunday at Soldier Field, they reinvented themselves again. They pulled out “Mountains of the Moon” in the first set, morphing from the song’s original, fragile Renaissance style (which almost always set the stage for “Dark Star”) to a jazzy exploration that segued into “Throwing Stones” (with the entire stadium singing the ashes to ashes chorus). It all sounded completely new yet utterly familiar, a self-affirming circle of adventure, comfort, challenge and affirmation. 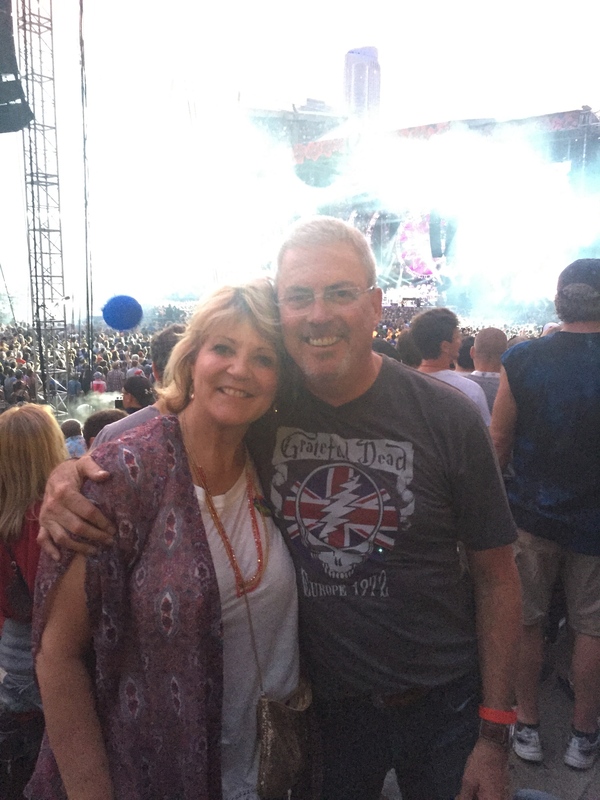 Tears were shed I went to Soldier Field telling myself, “There’s no crying at a Grateful Dead show.” I admit I did break down a little when they took the stage and began the show with a big bow and a group hug. It was pure joy after that. Still is. 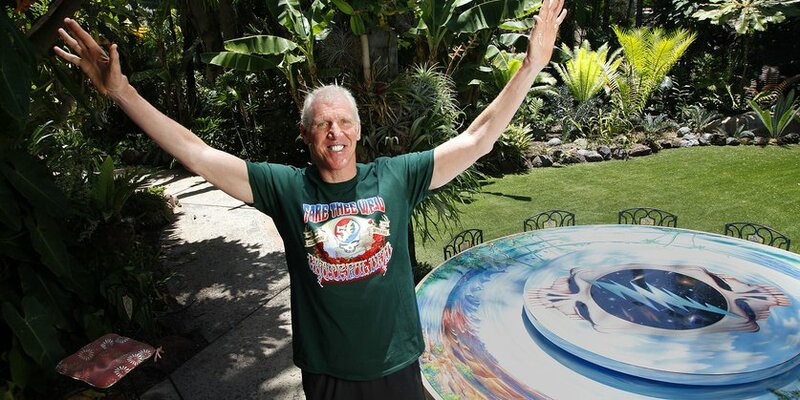 (Hat tip to Andrew Shapiro for making it all possible). Previous Post: 1965: A Perfect Year for Music? An inspiring recap. It must seem like an age has passed.